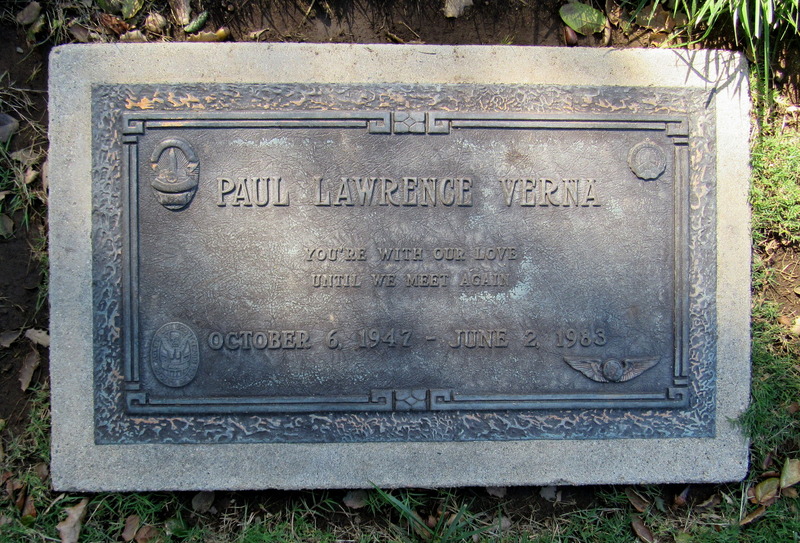 By all accounts, Officer Paul Verna was well-known and well-respected among his fellow members of the LAPD and the people he served. He was friendly, fearless and quick with a joke. More than 30 years after his death, the residents of the neighborhood he served still remember him fondly. And, in one of his final acts, Verna, a 14-year veteran of the department, helped to solve his own murder. Verna was born Oct. 6, 1947, the eldest child of John and Edith Dunn Verna. He was raised in North Hollywood, and his father worked as a decorator and salesman. His mother worked as a registered nurse until her son was born, and did not return to work until Verna and his younger sister, Susan, were teenagers. After graduating from Verdugo Hills High School, Verna served in the U.S. Air Force from 1965 to 1968. After his military service, he returned home and joined the LAPD and, on March 6, 1971, he married Sandra Switzer. A few years later, he left to work for about a year with the Los Angeles Fire Department, but he missed police work, and returned to the LAPD. Verna used his training and experience as a firefighter in December 1981 when he and two other officers rushed into a burning house in Chatsworth to rescue two mentally handicapped boys. When he couldn't get in through the front door, Verna broke windows at the back of the house to allow the heavy smoke to escape, then crawled inside to find the boys. For his efforts, Verna was awarded the LAPD's highest honor, the Medal of Valor. Less than two years later, on June 2, 1983, Verna, 35, was patrolling on his motorcycle in the San Fernando Valley when he pulled over a car on Hoyt Street at Gladstone Avenue, in the Lake View Terrace section of Los Angeles, for running a stop sign. According to witnesses, Verna spoke briefly with the occupants of the car, then the woman driving the car got out and was speaking to Verna on the street. One of the men in the back seat of the car leaned out the window and shot Verna with a handgun, then handed the gun to a man in the front seat. The second man walked over to Verna lying on the street, shot him five more times, then took Verna's service revolver before returning to the car, which sped off. Residents of the neighborhood rushed to Verna's aid, including an off-duty firefighter who administered CPR, and used Verna's police radio to call for help. Verna was taken to Lake View Medical Center, where he died about an hour later. Although his killers took his service revolver, they didn't take the slip of paper on which Verna wrote the name and address of the driver, and that provided the clue to track down his killers and arrest them two days later near San Diego. Two men and two women, all in their mid-20s and residents of Pacoima, were arrested. All four were also charged with a series of burglaries in the San Fernando Valley. One of the woman was convicted of being an accessory to Verna's murder, and was sentenced to six years in prison. The other woman, who was driving the car at the time, pleaded guilty and agreed to testify against her accomplices. She was sentenced to three years in prison. The two men were both found guilty of first-degree murder, and more than a dozen robbery charges, and were sentenced to death in 1985. Both are currently at San Quentin State Prison. Verna left behind his wife and two sons, Bryce, 9, and Ryan, 4 -– both now members of the LAPD. Verna was buried at Oakwood Memorial Park in Chatsworth -– just about three blocks from the site of the burning house he entered to rescue two boys. An estimated crowd of 6,000 attended Verna's graveside service, including nearly 4,000 uniformed officers from more than 50 police agencies in California, Arizona, Nevada and even Mexico, in a procession of 1,500 black-and-white patrol cars and 300 police motorcycles from the church to the cemetery. Along the route, in honor of Verna's service with the LAFD, were dozens of fire trucks, plus hundreds of people standing on the curbs, waving flags and saluting as Verna's hearse passed. Verna's sign is on the southwest corner of Hoyt Street and Gladstone Avenue in the Lake View Terrace section of Los Angeles, about two blocks east of the Foothill Freeway. When I stopped at the location of Verna's memorial sign to take this photograph, a woman who lived in the neighborhood was driving by, and she stopped and noticed the sign for the first time. I told her about the program to post memorial signs for all the LAPD officers killed in the line of duty. She agreed that it was a good idea, and the fallen officers should be remembered. Her eyes drifted back up to Verna's sign. "I remember him," she said, more than 30 years after his death. "He was a good man, a really good man. I remember that day. It was a tragic day, a terrible day."